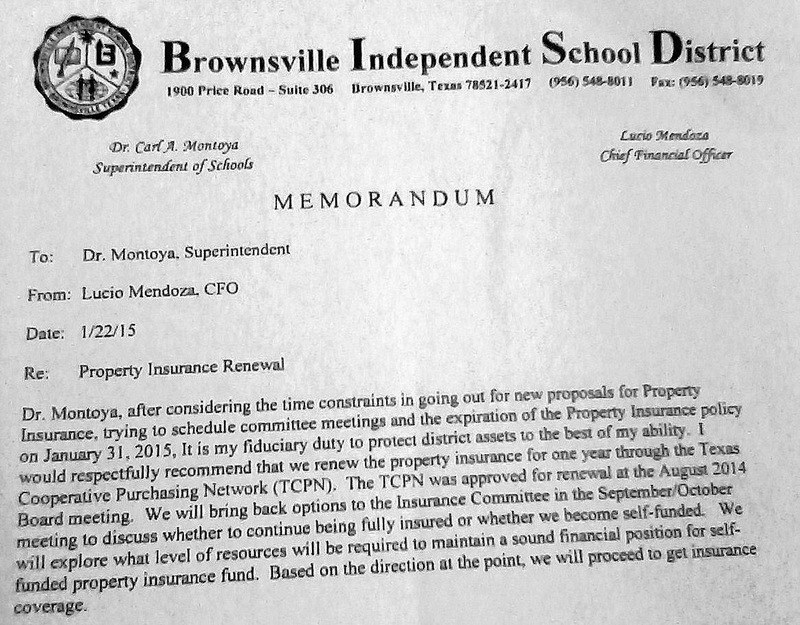 On January 13, a majority of the Brownsville Independent School District board told the administrators in charge of the $3.3 million property, windstorm, hail, boiler machinery insurance policies they were not satisfied with the recommendation that it be awarded to McGriff and Seibels and Williams of Houston, Texas. Despite the fact that there had been four meeting of the Insurance Committee and that the Request For Proposals (RFPs) for the lucrative awards had been issued in early December 2014 and that four proposals had received, two were not considered and deemed unacceptable. The remaining two – although under two different company names – were said to come from firms associated with McGriff, also the insurance consultant to the BISD. 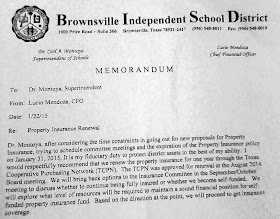 One trustee – Joe Rodriguez – said he was not satisfied with the choices recommended by the administration – namely Judy Cuellar, in charge of insurance, Rosie Peña, in charge of purchasing, Lucio Mendoza, Chief Financial Officer, and Superintendent Carl Montoya. The administrators were told to rebid and to come back with a different recommendation. “They thought they were paying too much to McGriff,” said a BISD administrator. From January 13 to the regular monthly board meeting February 3, the administrators did not come back to the board with an option for the board. It wasn’t until the day after the regular meeting, on Wednesday, February 4, that board members learned at the Budget Committee Meeting that under the item titled: “14. Discussion of Property Insurance renewal,” that the district’s administration had already approved the purchase and vendor of the insurance for the district without them being notified. Mendoza then pointed out that the board had approved joining the Buy Board in August 2014 and said he would bring back the insurance for another go at bidding out to vendors next September or October. He then stated that by that time, the board would have decided whether to continue with a vendor of go to self insurance. “Based on the direction at the point, we will proceed to get insurance coverage,” Mendoza wrote Montoya. On Dec. 25, Montoya answered Mendoza’s memo and authorized him to proceed. 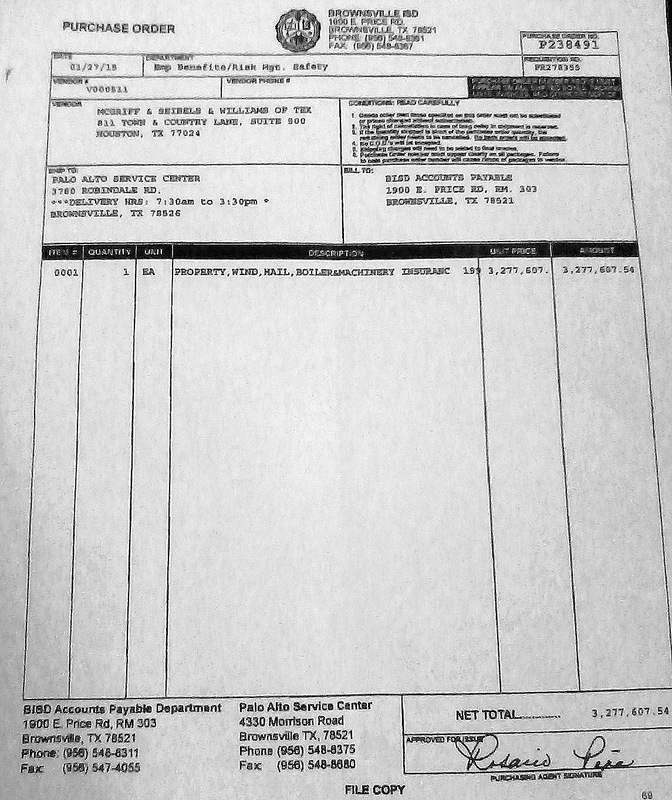 The Purchase order for $3.3 million made out to McGriff and Seibels and Williams of Houston by Peña of purchasing and the company was told to provide the coverage for the coming year. Some board members, who expected the administration to come back with alternatives to the proposals to the RFP, were aghast that the administration had taken it on their own to purchase the insurance without coming back to the board for direction or approval. Some BISD staffers said the administration could have asked the board to approve extending the current insurance for a month instead of binding the district to a $3.3 million contract for an entire year. They all said that they had never heard of a CFO, a superintendent, or a purchasing agent approving a contract without board approval. Others wondered whether it might have been the motive behind the recent reorganization of the board with the replacement of board president Otis Powers by Minerva Peña. Lurking in the background are questions on whether BISD general counsel Baltazar Salazar may have advised Montoya and the other administrators to use the “fiduciary responsibility” excuse to unilaterally award the $3.3 million contract on their own. Salazar has often been called the “eighth board member” because of his style of offering policy actions unrelated to his role as legal advisor. Did Montoya, Mendoza and Rosie Peña act on Salazar’s advice? Also questioned was the fact that trustee Cesar Lopez works for the TCPN, and may have played a role in the awarding of the lucrative contract to McGriff. Lopez was the purchasing agent for the Mercedes Independent School Board before he was appointed to the board after former trustee Christina Saavedra resigned to go to San Antonio. This entry was posted on Friday, February 6th, 2015 at 7:33 am and is filed under Uncategorized. You can follow any responses to this entry through the RSS 2.0 feed. Both comments and pings are currently closed.